Margaret Neill is known for gracefully composed abstractions in which suggestive rounded forms seem to glide over carefully worked surfaces. Neill's most recent paintings have a heightened engagement with color, adding a new quality of light and atmosphere to their layered complexity. Her palette which has in the past displayed a quiet earthiness has now blossomed into flower utilizing rich softened pastels within carefully balanced arrangements that show an exquisite sensitivity to the parameters of her formats. 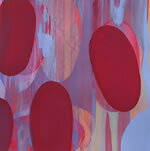 Her paintings conjure a sense of motion in stillness. Her rounded forms tease us with their gentle restlessness, threatening to change colors chameleonlike at their edges, or tugging at their boundaries seeking to slide into new arrangements. It is of interest that Neill is an avid canoeist as a sense of floating pervades her work. In a sense these are 'pictures of a floating world', a world in which the stillness of a painting is a paradox poised against the restless motion of life and fleeting time. Time enters this work through the very process of painting, with multiple decisions, a layering of scraped and repainted passages, compounding across their surfaces like maps of their own making, before finally settling into something like a stop along the way, a welcome place where we can rest and draw a breathe before resuming the path. 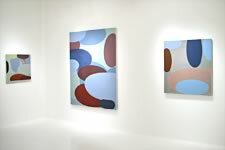 Neill has stated that the shapes in her work, "...are indirectly related to molecular structures and have a feeling of moving across and through the picture plane. They are a response to movement, stillness, silence, sound, darkness, and light." There is potent energy to be found in the crossing points within this group of oppositions and Neill has harnessed this to create a beautiful new group of work which transmits a feeling of that physical hum and resonance which is deeply embedded in the visual experience. Margaret Neill's paintings are in several important collections including the Museum of Modern Art, the New York Public Library, the Brooklyn Museum, and the Chicago Museum of Contemporary Art. 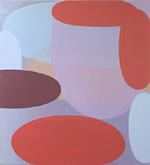 Her work has recently been featured in New American Paintings number 44, published in March, 2003.